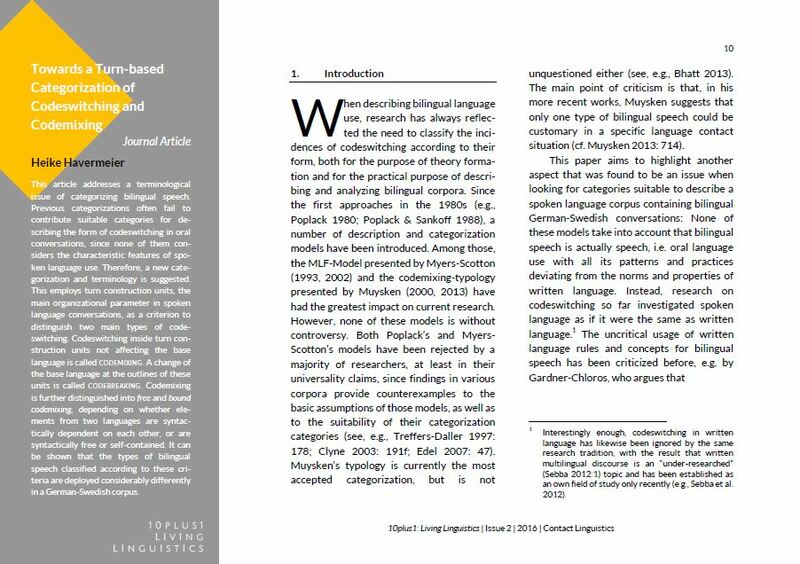 This article addresses a terminological issue of categorizing bilingual speech. Previous categorizations often fail to contribute suitable categories for describing the form of codeswitching in oral conversations, since none of them considers the characteristic features of spoken language use. Therefore, a new categorization and terminology is suggested. This employs turn construction units, the main organizational parameter in spoken language conversations, as a criterion to distinguish two main types of codeswitching. Codeswitching inside turn construction units not affecting the base language is called codemixing. A change of the base language at the outlines of these units is called codebreaking. Codemixing is further distinguished into free and bound codemixing, depending on whether elements from two languages are syntactically dependent on each other, or are syntactically free or self-contained. It can be shown that the types of bilingual speech classified according to these criteria are deployed considerably differently in a German-Swedish corpus. Heike Havermeier, born 1983 in Detmold, Germany, studied Linguistics, German and Scandinavian Studies at Westfälische Wilhelms-University in Münster. She finished her Magister of Arts in 2009 and also obtained a degree in teaching German as a foreign language at the Goethe Institute in 2010. Since 2010, she has been working at the University of Gothenburg as a teacher and doctoral researcher in German studies. In 2016, she completed and successfully defended her PhD thesis on bilingual speech.